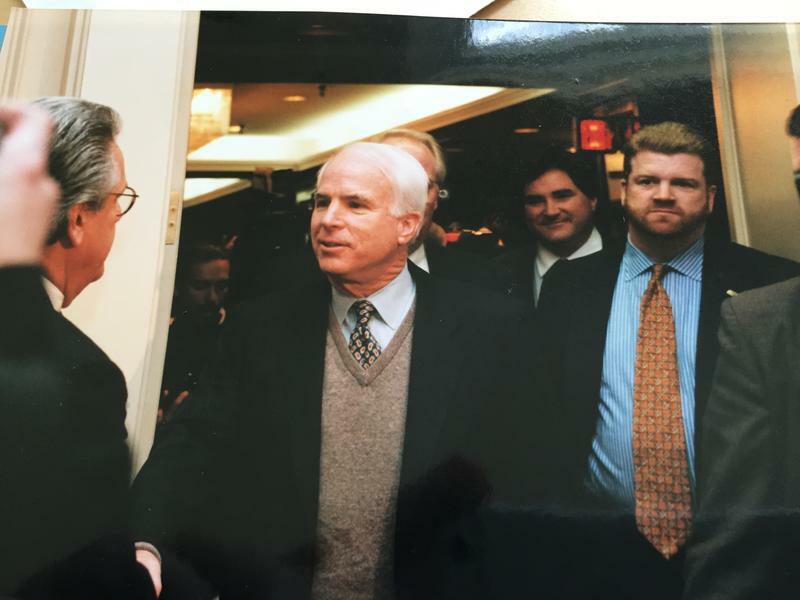 Ben Davol, right, was Senator John McCain's Connecticut director during the 2000 Republican presidential primary. Ben Davol lives in Mystic, and was a pledged delegate for McCain at the Republican National Convention in Philadelphia. 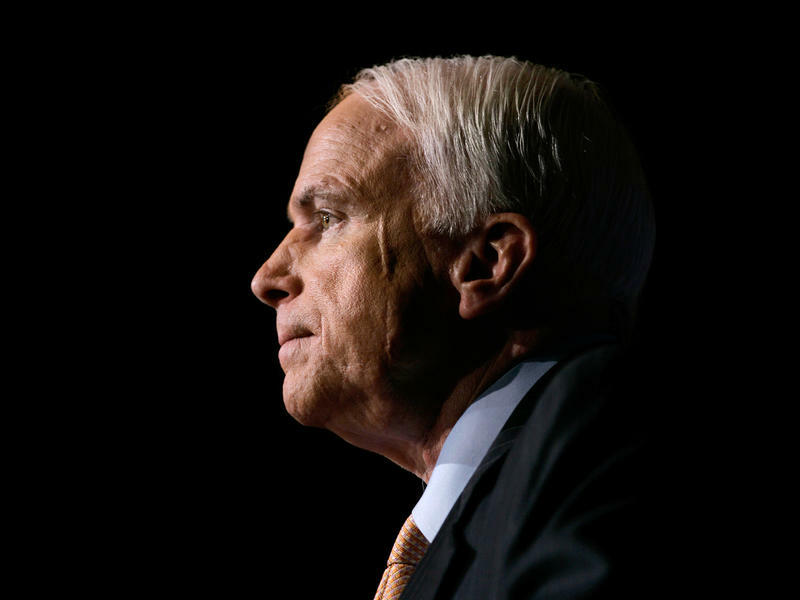 McCain lost the nomination to George W. Bush, who would go on to become president. I was 7 years old and my father, who was career Navy, told me that he had been taken prisoner in Vietnam and my dad had met John McCain’s dad. They didn’t sail together but he knew John McCain’s dad, respected him a great deal -- and when he heard of McCain being shot down, he educated me a bit on the Vietnam War and I paid attention. Then all through my childhood growing up, I was always waiting for the senator to be released and I remember when he was released, watching it on TV and then followed his career, then always hoped I could meet him someday. At the convention, what was interesting, there were six delegations that had supported McCain in the primaries. We were given direct orders to not, when the McCains came to speak, do any sort of protest. We could clap and all. But we weren’t allowed to bring in signs or paraphernalia but we actually smuggled in signs. In particular, the Rhode Island and Connecticut delegations made quite a noise when the senator came on the stage. When I was in New Hampshire campaigning for him, the directness in which he told factory workers that their factory was not coming back, but that they needed to do other things, and that he was going to help them and he wasn’t going to forget about them. But he said he’s not going to lie to them and tell them that their factory is going to come back. The world economy was such, that it was just not gonna happen. His directness to people who were pro-choice, and he was pro-life, where he didn’t vacillate on the issue but was so respectful, and kind, and direct. It really taught me that Americans will support somebody they don’t totally agree with. They’ll support people who can relate to them. John McCain never big-timed anybody and that’s the key thing. He always treated every single person he met with the same degree of respect -- it could be a king, or a president, or a taxi cab driver -- and I think that’s something I really took to heart. I think he should remembered just as a great American. He would scoff at “icon” or “hero.” He didn’t care for those kinds of titles. He did care about his responsibility and his role as being an American. So that’s really what he would really want people to think of him -- as a proud American who tried to contribute and do so honorably. Unlike many politicians today, he admitted when he was wrong. For instance, he originally had supported the Confederate flag in South Carolina, and then afterwards, stood up and said, “I was wrong on that issue.” And he did that a number of times. But it didn’t detract from his veracity on issues of the day. I think it’s a lesson learned. He was not this pejorative term people use called RINO, he was not a ‘Republican In Name Only.’ You go down and look at his voting record, he’s as conservative as one comes. But you can be loyal to your issues and loyal to yourself but do so in a way that’s respectful and in a way that can possibly bring more people on your side. I remember him talking about this. You know, the people that support you, support you. Your job is to convince those in the middle. Because those opposed to you probably aren’t going to change. So if all you’re going to do is tell people they’re wrong, you’re not going to build your base. McCain leaves behind his wife of more than three decades, Cindy; seven children, including three from his first marriage, to Carol Shepp; and his 106-year-old mother, Roberta McCain.